If you’re a red-blooded American, it’s not hard to love Marvel’s CAPTAIN AMERICA movies and all that they represent, including the latest installment CAPTAIN AMERICA: CIVIL WAR, but there’s something deeper that every believer, in every culture, can appreciate about the character Steve Rogers. Having grossed more internationally than domestically, the Captain America series has transcended nationalism (most evidently in THE WINTER SOLDIER and CIVIL WAR), and instead seems to be driven by values that stem from something higher. It’s a classic line we all know in THE AVENGERS where Steve Rogers tells Black Widow, “There’s only one God, and I’m pretty sure he doesn’t dress like that.” Even though the movie was written and directed by self-described atheist Joss Whedon, the filmmakers kept Rogers true to his character and the time when he grew up. While Steve’s religious beliefs aren’t touched upon elsewhere in the movies, and seldom in the comic books, it’s crucial to understand that Steve believes in something higher. If you go a step further and look at the source material, that “something higher” is clearly the one God of the Bible. From the time he was a skinny runt in Brooklyn during World War II to the super soldier battling aliens, secret cabals and his own government, Steve understood that liberty isn’t cheap, it must be acheived. The desire to fight against injustice is engrained in the Christian story, from Moses, to David to Jesus Himself, who stood against the Roman Empire and the Pharisee’s as the Son of God (John 1:49). This is relevant for both Americans, and those overseas in countries like China, where freedom to worship God is extremely limited. The new Captain America movie, CIVIL WAR, has Steve Rogers aka Captain America, resisting Iron Man creator Tony Stark and the U.S. government because they want to place the Avengers team under the arbitrary authority of the United Nations, therefore taking away any freedom of choice from the team. The major disagreement between Tony and Steve comes down to the tension between law and liberty. As Christians, both are gifts from God and both are incredibly important. What viewers see in CIVIL WAR and in reality is that our human nature tends to ruin both law and liberty. Government oversteps its God-ordained limits and regulates things it shouldn’t, and civilians take advantage of their liberty and trade moral personal responsibility for lawless hedonism. What Steve understands is that the law, while good, should never enslave, but protect people from evildoers (Psalm 119:92, Romans 7-8:11). If THE WINTER SOLDIER is mostly about liberty, CIVIL WAR is about self-government, the idea that we’re responsible for our own choices and our own actions, and shouldn’t pass blame to others. Self-government, or self-control, is probably one of the most unpopular ideas in today’s culture. If there’s one thing we can learn from Adam in Genesis, it’s that blame shifting never accomplishes anything. From the very beginning, Steve Rogers was chosen to be a super-soldier, not because of a skill set, but because of his values and his compassion. As Dr. Erskine stated in THE FIRST AVENGER, “This is why you were chosen. Because a strong man, who has known power all his life, may lose respect for that power; but, a weak man knows the value of strength, and knows compassion.” No matter how “great” he becomes, it’s goodness that defines Capt. America and goodness that he pursues. Because the government, and society as a whole, is made up of individuals who make mistakes, we can’t follow others blindly. Even when everyone says that we’re wrong, we have to stand for morals and values that go beyond public opinion. While this topic isn’t addressed comprehensively in the CAPTAIN AMERICA movies, it returns us to Point Number 1 above. There is a God who has all authority, and because every single person falls and compromises, we have to align our values with the One True God who never changes. 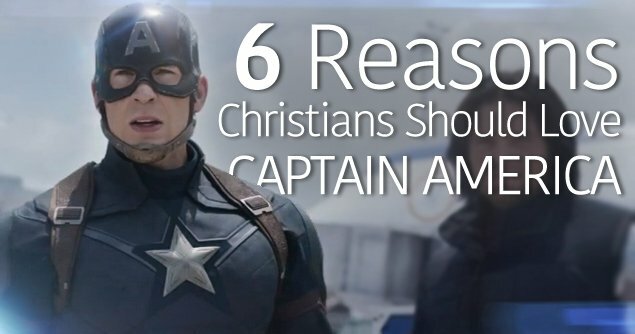 Captain America never spells this out, but it’s no accident that this theme of standing for greater values even when the world says you’re wrong takes place in a Christian cathedral in CIVIL WAR. Read the full review for CAPTAIN AMERICA: CIVIL WAR here.